Western blot analysis of extracts from 293 cells, transfected with 100 nM SignalSilence® Control siRNA (Unconjugated) #6568 (-), SignalSilence® p42 MAP Kinase (Erk2) siRNA I (+) or SignalSilence® p42 MAP Kinase (Erk2) siRNA II #6578 (+), using p42 MAP Kinase (Erk2) Antibody #9108 (upper) or α-Tubulin (11H10) Rabbit mAb #2125 (lower). 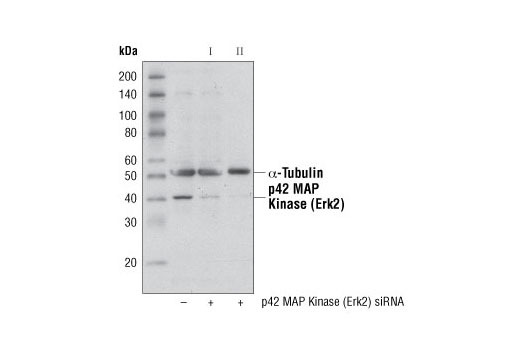 The p42 MAP Kinase (Erk2) Antibody confirms silencing of p42 MAP Kinase (Erk2) expression, while the α-Tubulin (11H10) Rabbit mAb is used as a loading control. CST recommends transfection with 100 nM p42 MAPK (Erk2) siRNA I 48 to 72 hours prior to cell lysis. For transfection procedure, follow protocol provided by the transfection reagent manufacturer. Please feel free to contact CST with any questions on use. SignalSilence® p42 MAPK (Erk2) siRNA I from Cell Signaling Technology (CST) allows the researcher to specifically inhibit p42 MAP Kinase expression using RNA interference, a method whereby gene expression can be selectively silenced through the delivery of double stranded RNA molecules into the cell. All SignalSilence® siRNA products are rigorously tested in-house and have been shown to reduce protein expression by western analysis. Mitogen-activated protein kinases (MAPKs) are a widely conserved family of serine/threonine protein kinases involved in many cellular programs, such as cell proliferation, differentiation, motility, and death. The p44/42 MAPK (Erk1/2) signaling pathway can be activated in response to a diverse range of extracellular stimuli including mitogens, growth factors, and cytokines (1-3), and research investigators consider it an important target in the diagnosis and treatment of cancer (4). Upon stimulation, a sequential three-part protein kinase cascade is initiated, consisting of a MAP kinase kinase kinase (MAPKKK or MAP3K), a MAP kinase kinase (MAPKK or MAP2K), and a MAP kinase (MAPK). Multiple p44/42 MAP3Ks have been identified, including members of the Raf family, as well as Mos and Tpl2/COT. MEK1 and MEK2 are the primary MAPKKs in this pathway (5,6). MEK1 and MEK2 activate p44 and p42 through phosphorylation of activation loop residues Thr202/Tyr204 and Thr185/Tyr187, respectively. Several downstream targets of p44/42 have been identified, including p90RSK (7) and the transcription factor Elk-1 (8,9). p44/42 are negatively regulated by a family of dual-specificity (Thr/Tyr) MAPK phosphatases, known as DUSPs or MKPs (10), along with MEK inhibitors, such as U0126 and PD98059. Roux, P.P. and Blenis, J. (2004) Microbiol Mol Biol Rev 68, 320-44. Baccarini, M. (2005) FEBS Lett 579, 3271-7. Meloche, S. and Pouysségur, J. (2007) Oncogene 26, 3227-39. Roberts, P.J. and Der, C.J. (2007) Oncogene 26, 3291-310. Rubinfeld, H. and Seger, R. (2005) Mol Biotechnol 31, 151-74. Murphy, L.O. and Blenis, J. (2006) Trends Biochem Sci 31, 268-75. Dalby, K.N. et al. (1998) J Biol Chem 273, 1496-505. Marais, R. et al. (1993) Cell 73, 381-93. Kortenjann, M. et al. (1994) Mol Cell Biol 14, 4815-24. Owens, D.M. and Keyse, S.M. (2007) Oncogene 26, 3203-13.